Everyone loves good food. Well, mostly everyone. There are some people out there that would surprise you as they looked down upon the epic slice of pizza folded in your hands, or the cookie the size of your head, or perhaps that cheeseburger oozing with three different flavors of cheese, bacon, and barbecue sauce. Now that everyone is hungry for their favorite food, maybe you can take a moment to discover a special holiday gift for another food lover in your life. There are far more food-related gifts than you may have once though, and they all look pretty scrumptious. Cookies and milk. Easily one of the most iconic snack foods for all ages, even if you’re well into adulthood. The thought of dipping a warm chocolate chip cookie, or even a store bought, packaged cookie, makes everyone’s mouth salivate. 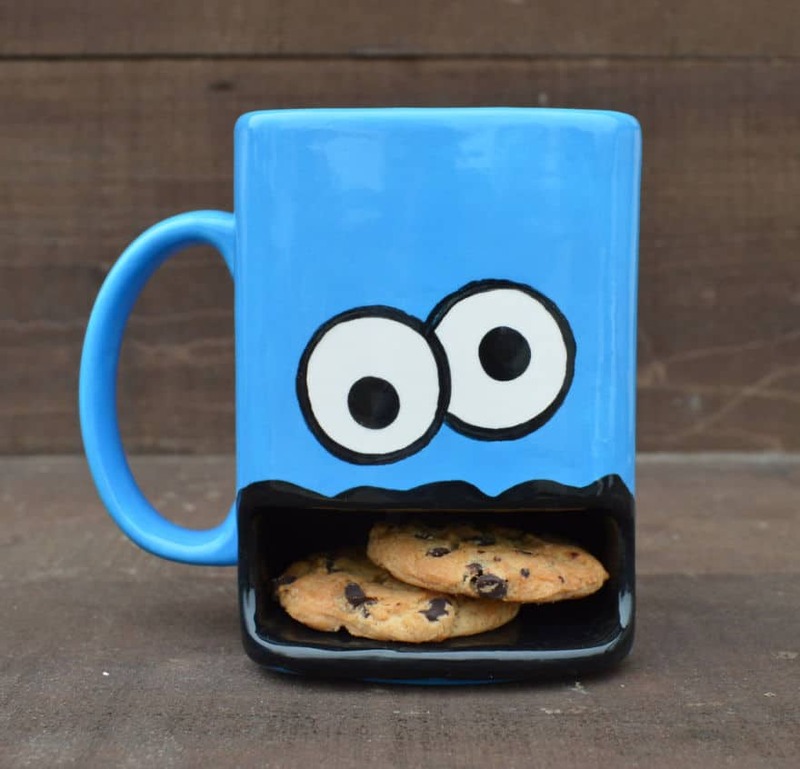 Now, however, for the cookie lover in your life, you can combine for those favored things into one easy-to-carry mug, where the cookies are inserted into a compartment at the bottom of the mug. Just be wary of tipping the entire thing over, otherwise there will be a few spilled cookies on the floor and one angry individual holding an empty cup in their hands. It is finally the holiday season, which means you can break out the hot chocolate mugs, the mini marshmallows, and the peppermint candy canes for the kids. 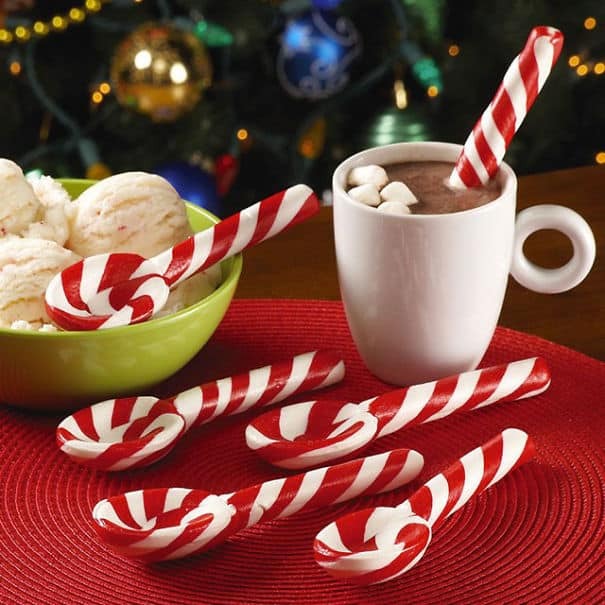 Of course, treats like those aren’t only for the children, as you can now use these new candy cane stirs to…well, stir your hot chocolate or coffee while sitting in the warmth of your own home. The flavor will, obviously, enhance the hot chocolate. The taste of melted peppermint and chocolate mixed together should make anyone happy, unless they are the Grinch. Give this one a try with the young audience, you’re sure to win a few fans. Pizza is one of the best foods in the world, said almost everyone in the entire world. Generally, someone eating a pizza will have had theirs pre-cut, as they purchased it through one of the local shops. However, that would be a shame, as cooking homemade pizza is incredibly fun, fulfilling, and offers the chance at putting your own custom toppings on. Unfortunately, it means you have to cut the pizza by hand, but that doesn’t have to be a bad thing with these new pizza scissor cutters. 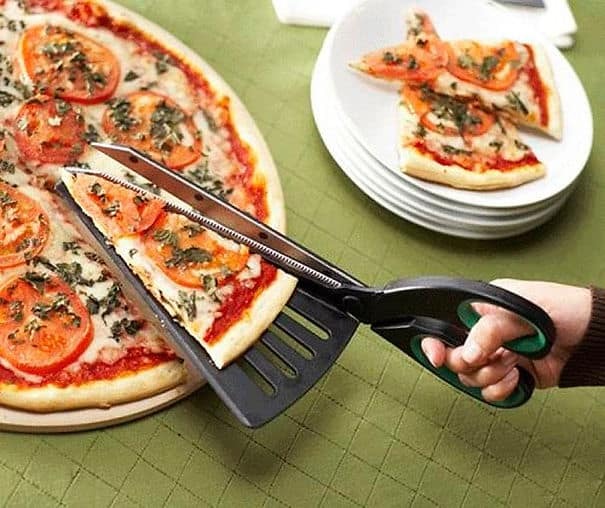 If you’ve ever felt the need to cut a pizza down the center using a giant pair of scissors, this gift has you covered and then some. Sharks are pretty cool, right? Yes, until you get up close and personal with them in the water, and then they’re just plain terrifying. 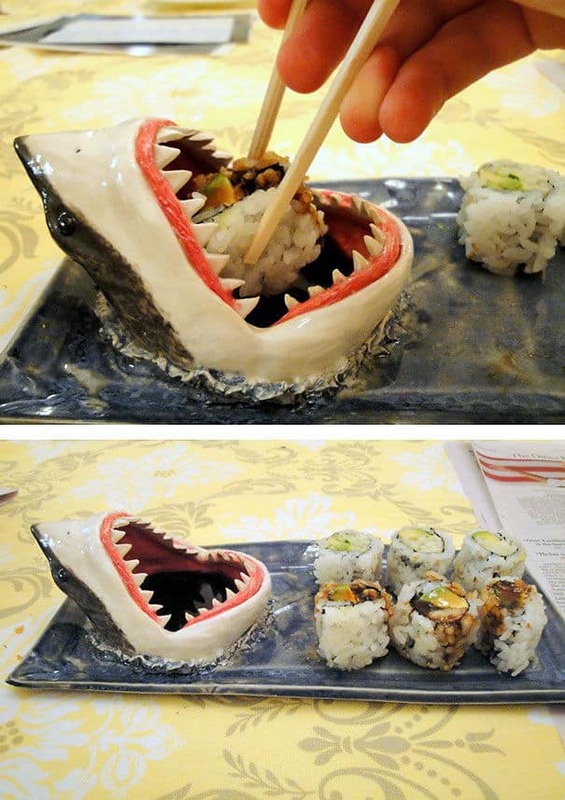 However, stick your dominance in their face with this latest dinnerware, which offers consumers the chance to eat sushi directly out of a shark’s mouth. The interior of the mouth is shaped like a small cup, allowing you to insert your desired sauce, such as soy sauce, with an open mouth to dip your chosen sushi in. Not only will your friend’s envy you, but the fish world will probably actively hunt you when you step into the water. The choice is yours, sushi king. That title makes this unique gift sound entirely disgusting, but that’s not really the case. In fact, this next one is actually quite cool, as it allows you to separate the yolk from your egg in the easiest manner possible. If you find yourself doing a lot of baking, especially around the holiday season, then this may be the perfect option for separating those eggs in the easiest fashion possible. Of course, if you like to bake with your family, specifically of the younger variety, then this little novelty item should be a hit amongst the miniature bakers in your life. 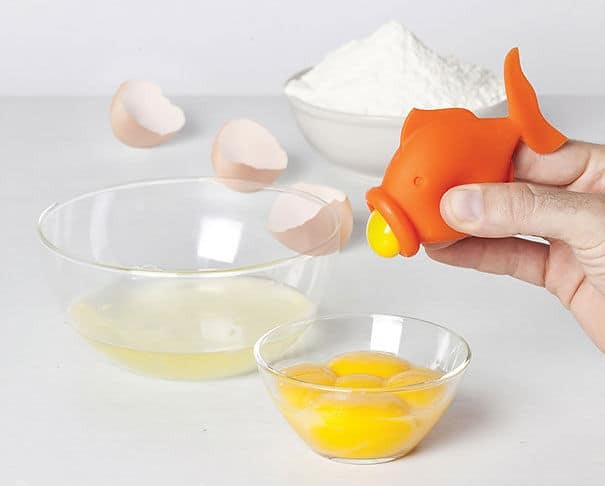 You may never have to separate an egg again in your life. Halloween may have long past us by for this year, but there is always next year, too. 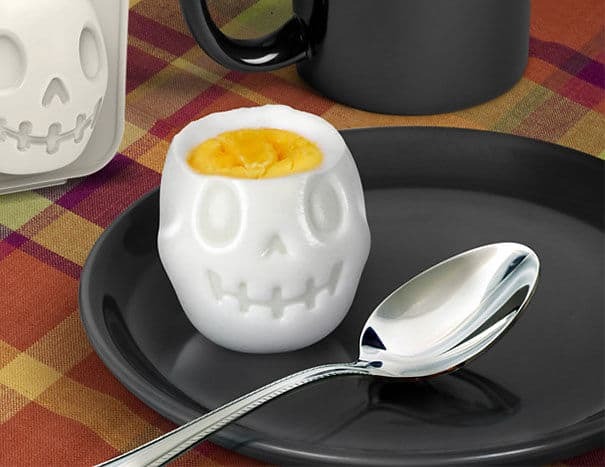 When you’re looking for a unique after-school treat for the kids, or just want to something fun once in awhile, then making your hard-boiled eggs into the shape of a smiling skull is the way to go. The skulls are happy, so you certainly won’t scare anyone away, and the brains at the top are fashioned from the yolk, giving it a cutesy appearance. For those who enjoying the yolk the most, the opened top could prove to be perfect for scooping out the interior. Or, you could just bite into the entire thing, either way works. 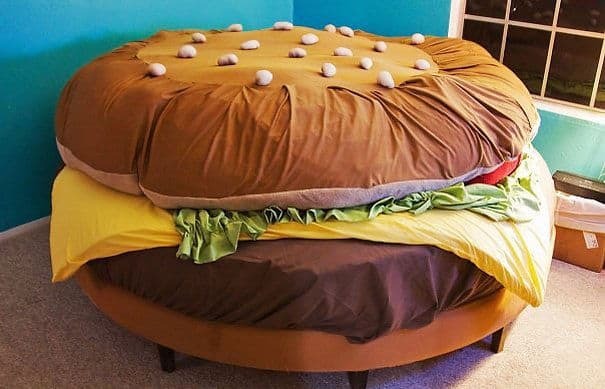 Have you ever wanted to sleep in between the buns of a hamburger? Of course, everyone has, right? Well, that is completely possible now, all thanks to this new bed shaped and molded to look like an entire cheese burger, lettuce, tomato, and cheese included with your order. Unfortunately, there don’t appear to be any french fry pillows included, which is a shame, honestly. It won’t matter if the gift is for a grown adult or a child, they’re going to love jumping into this bed and smothering themselves with the top bun until they’ve fallen asleep. Just don’t let them cook too long. Imagine: It’s a hot summer day, the sun is beating down overhead, birds are chirping, and you’re sweating from running around the neighborhood. What could help improve this situation? Why, an ice cream cone, that’s what. Fortunately, ice cream is good at any time of the year, not just the warm summer months. But you can’t eat ice cream all the time. So, why not get these gifts for someone. Then they can look at their favorite sweet treat whenever the lights need to be turned on in their room. The cone will hang down low, with the light escaping the bottom. 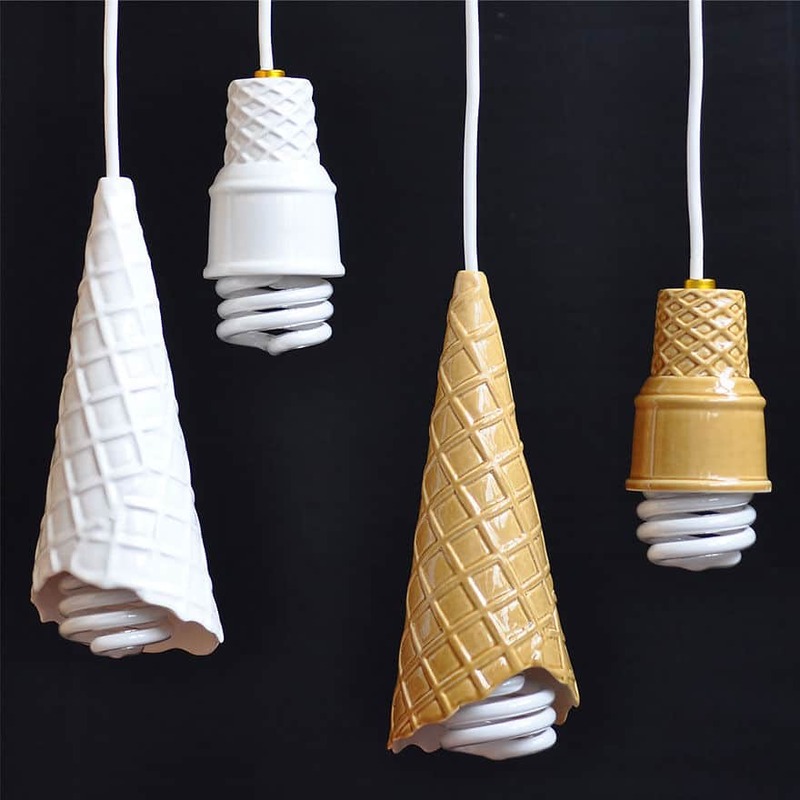 The cones even come in a variety of sizes and flavors, too. A lot of these food-related gifts tend to be aimed for a younger crowd, but that doesn’t always have to be the case. Take, for example, this spoon and fork set with engraved writing in their fronts. 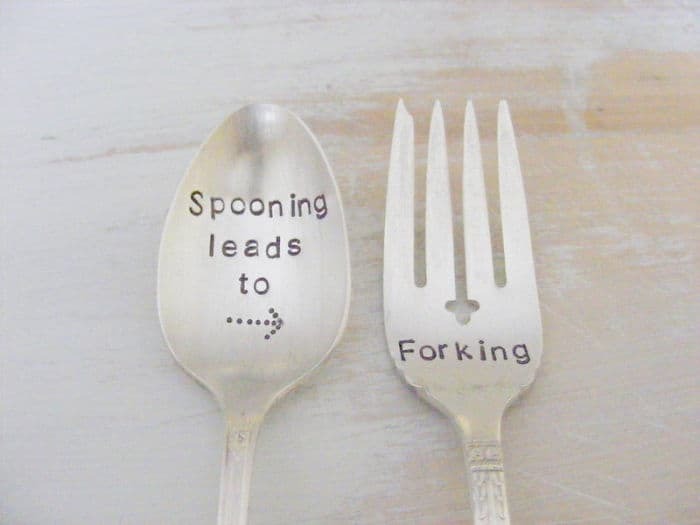 “Spooning leads to Forking,” they read, and it is a fitting inscription for the loved one in your life. They’ll probably find it hilarious, and then downright romantic if they have a love of food and you. Whoever gets this gift will most likely emanate a slight giggle each time they sit down to eat with these utensils. It should be a fun time for the dinner table. Much like the hamburger bed, the pizza bed offers everyone a chance to become a topping on their favorite good. Sliding underneath the cheese and pepperoni blanket may be weird at first, but we promise it will be a fun experience once you discover what it’s like to be a slice of pizza. Of course, you’ll be able to speak, and pizza cannot, unfortunately. Kick things up a notch by making use of the crust pillows, which actually look a lot more comfortable than they may appear at first. 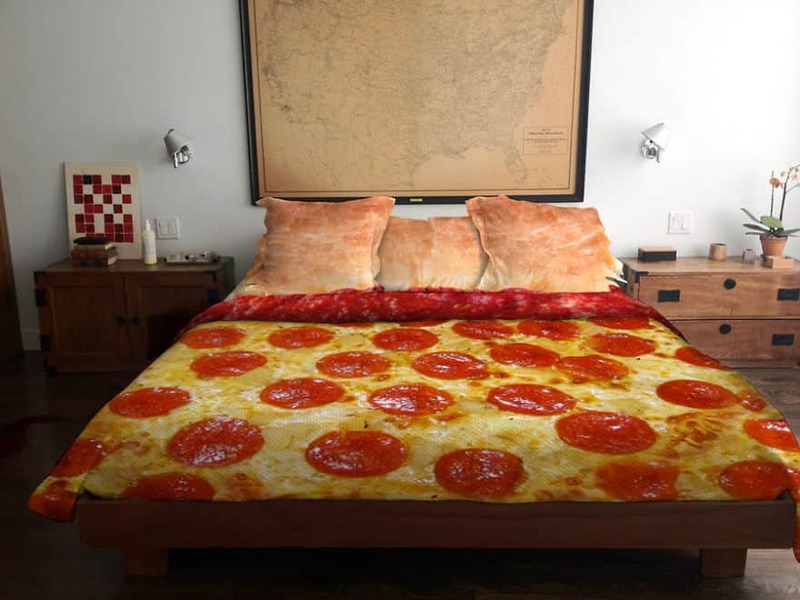 Your significant other may find the sight of pizza on their bed horrid, though, so be wary of how often you sleep in pizza. Cookies and soap. Great, sweet treats and smelling good. Those are two wonderful things, which generally don’t go together in any slight way. However, this gift changes all of that, as you can now order cookie-shaped soap to use in the bathroom. If you’ve ever wanted to just rub an entire Oreo over your body, which surely there are people out there interested in this, then this gift will allow you to live out that little fantasy. You probably won’t smell completely like chocolate and cream, though, but probably something a little fresher. If you have a favorite cookie, it may be worth the extra time to locate it in soap form. So, you’ve got yourself in some freak accident involved a dinosaur, a shark, and a little league team. It’s understandable, honestly. Something like that could happen to anyone. However, if you’re looking to gain some of your honor back, you may want to slap a piece of bacon over the cut. 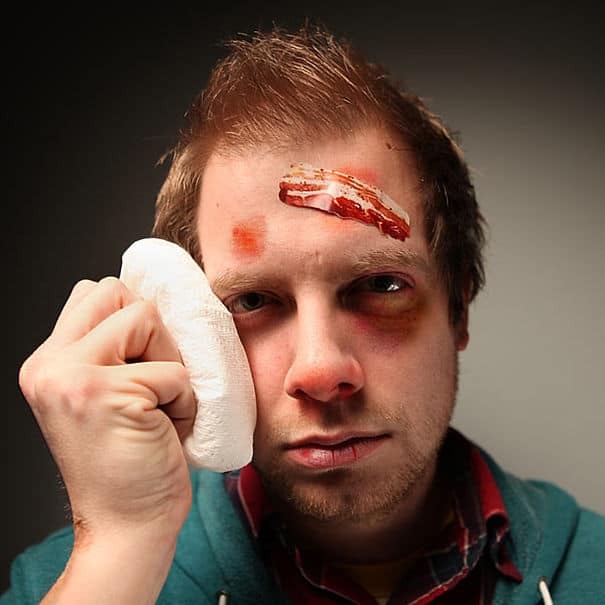 Unfortunately, this isn’t real bacon, otherwise no one would ever mess with you again, but it is fun to think about. Give this gift if you find your loved one, friend, or co-worker hurting themselves more often than they should. A cut won’t seem so bad when it’s covered in everyone’s favorite breakfast food. Writers tend to have a favorite snack while they’re working on their latest piece of work, whether it’s an entire novel or a simple poem. The brain grows hungry, and something sweet is always enticing. 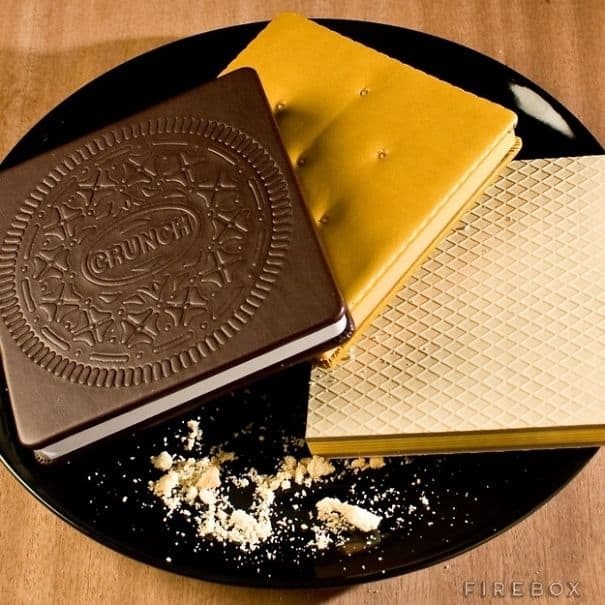 So, combine two of their favorite things together: cookies and a notebook. The notebook may not be edible, but ti certainly looks delicious enough to satiate some hunger pains while they’re writing away in the book. It’s a novelty gift, to be sure, but it’s one that the right person will adore. 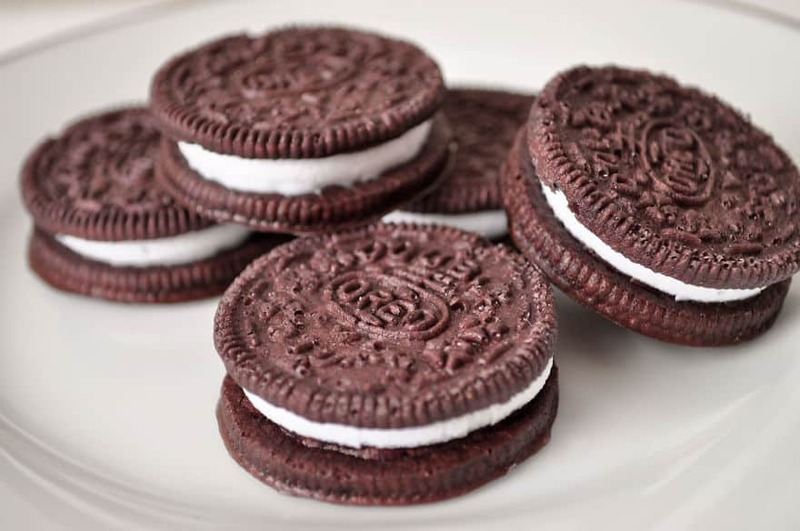 These gifts come in a variety of types, including wafers and sandwich cookies, so there should be a favorite for everyone. Do you, or someone you know, ever get tired of cooking their hot dogs and buns separately? It’s understandable, and something that needs to be fixed. 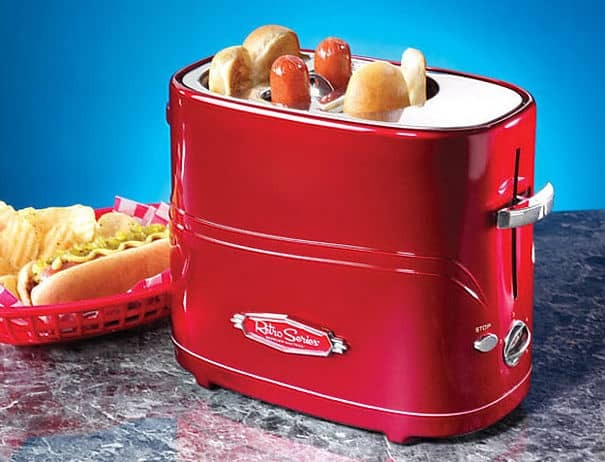 Out comes this new little machine, where you can cook up to two full hot dogs, including toasting their buns, all at once. It’s the perfect gift for anyone who finds themselves watching the weekly sports game, or perhaps they’re having a small cookout in the back yard with the family. The grill isn’t always a viable option, so this little gadget will prove useful more often than not. You may end up with hots dogs quite a few times a week, though.